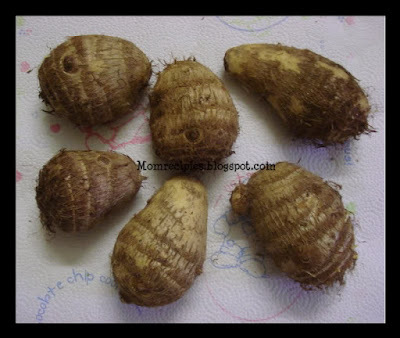 1) Pressure cook Colacasia / Taro root in a cooker for 1 whistle. 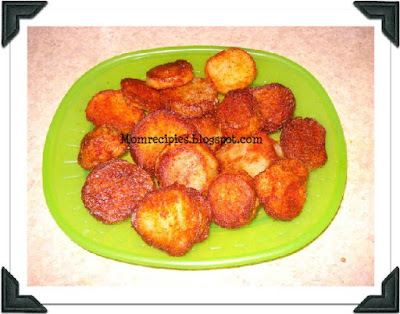 2) After they are cooked, peel and slice them to quarter inch pieces. 3) Heat oil in a frying pan.When the oil begins to crackle, gently add the slices and fry to a golden brown color.It should be crispy in nature. 4) Add salt, red chili powder and mix well. 5) Serve hot with hot hot rice as a side dish !!! Humm new for me, looks good!! Beautiful, love the bright colour. That's something new, but sounds like French fries. Thanks for sharing. perfect snack with ketchup.